Construction, demolition, and cleanup projects are inherently hazardous. Accident rates in these industries are accordingly higher than in other industries. OSHA’s mission is to reduce these accident rates through safety rules and regulations. This course provides an introduction to the OSHA rules that cover common situations, for example, fall prevention, scaffold safety, worker safety in trench work, asbestos and lead exposure, electrical hazards, respirator use, and nail gun use. 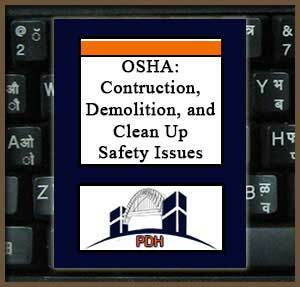 The course is based on twenty-four OSHA Quick Cards and Fact Sheets related to hazards associated with construction, demolition, and cleanup. As a result, the course material is concise, easy to read, and easy to remember. Cold stress equation and how to protect workers from cold-temperature dangers. This course is intended primarily for civil and construction engineers and others who serve as project managers in construction, demolition, and cleanup projects.